Corey Jackson’s summer schedule is a full one. The doctoral student at the School of Information Studies (iSchool) has received two prestigious fellowships that will keep him busy over the next few weeks while helping him fill out his future career plans. Though the fellowships are focused in different areas, they combine to provide the experience and grounding for Jackson’s ultimate career goals: being an information science researcher, professor and entrepreneur. Jackson, who came to the School of Information Studies in 2012, soon will start a two-week teaching fellowship at the iSchool Inclusion Institute at the University of Pittsburgh School of Information Sciences. There, he will co-teach a two-week Python programming module, part an effort to help the University of Pittsburgh fulfill its goal of getting more underrepresented students interested in the information science field, Jackson says. He will receive an honorarium, full funding for travel, course supplies and housing accommodations. Soon after, Jackson will begin a fellowship at the Research Development Alliance (RDA), an international organization dedicated to data sharing initiatives. He’ll be partnered with a mentor for the next 12 months, when he’ll investigate issues of privacy, data sharing and data integration in crowdsourcing projects, and be able to fine-tune his doctoral dissertation focus. The RDA fellowship comes with a $5,000 summer stipend, and the opportunity to present at plenary conferences. Jackson is on the schedule to present at the RDA’s September conference in Paris. The fellowship at the University of Pittsburgh is one Jackson sought in order to further develop his teaching skills, he says. “I like to consider myself an entrepreneurial Ph.D. student, and I’ve always had an apprehension about teaching, only because I didn’t think I’d be good at it,” he says. He has developed course material and a lesson plan, and will co-teach the course, and reasons that with its short timeframe, this was a good way to dip a toe into teaching. “My goal is to teach a full course before leaving the doctoral program, so I see this as a stepping stone to helping me become more comfortable teaching,” he says. Jackson’s second fellowship is an elite one. Only eight fellows were selected this year, and last year, the program had a 17 percent acceptance rate. He will work with a mentor, Kalpana Shankar, from the School of Information and Library Studies at University College Dublin, Ireland, in affiliation with the RDA. The global organization awards fellowships to engage early-career researchers in efforts to eliminate technical and social barriers to research data sharing. It also seeks to build “the social and technical bridges that enable open sharing of data” … with a vision for “researchers and innovators openly sharing data across technologies, disciplines and countries to address the grand challenges of society.” The RDA was started in 2013 by the European Commission, the US National Science Foundation and National Institute of Standards and Technology, and the Australian Government’s Department of Innovation. Jackson’s time with the RDA will be focused on a data integration question, and he has proposed to conduct an ethnography of scientists to assess whether using crowdsourced data changes their practices and the scope of their work. He says he hopes to be able to connect with scientists conducting medical research on crowdsourcing platforms where individuals contribute to research by sharing personal health data. 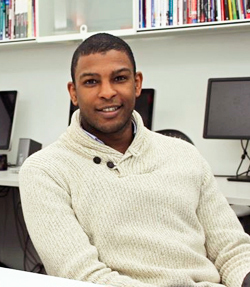 At the iSchool, Jackson’s research focus is online citizen science communities. He is affiliated with Associate Professor Carsten Oesterlund and Distinguished Professor of Information Science Kevin Crowston’s National Science Foundation grant investigating participant motivation and learning in Zooniverse citizen science projects. But there’s even more on Jackson’s already-full plate. He’s an information entrepreneur who, with David Pierre, a doctoral candidate in bioengineering at the College of Engineering and Computer Science, has developed a startup called ElectroChem Tracking LLC. They entered their concept in–and won–last year’s prestigious Goldberg Prize for Technology and Innovation in the annual Central New York region Panasci Business Plan competition. Their team won $10,000 in that competition to continue moving their idea to market. Their product idea involves creating a biosensor that monitors corrosion levels in hip implants, then communicates its findings through Bluetooth technology to an app on a computer or tablet. The sensor monitors electrochemical changes in the implant’s surrounding environment. It’s an innovation that bypasses the methods currently being employed to do that, according to Jackson.